Beat Presser: [Herzog and Presser are looking at Presser's famous picture of Kinski trying to strangle Herzog] I truly like this very much. It happened because he must have sensed the presence of your camera. Beat Presser: He also just wanted to let you have it, didn't he? Werner Herzog: Every grey hair on my head, I call Kinski. 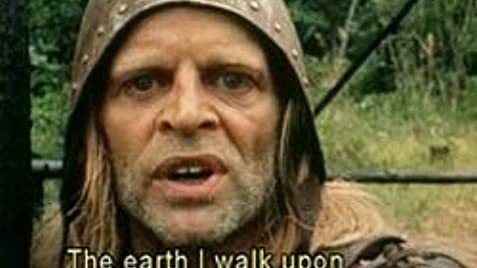 The documentary made by Werner Herzog tells about the legendary love-hate relationship between the director who was ready to climb to Hell for his every movie and border-line insane genius actor Klaus Kinski who might have been one of the creatures from Hell that Herzog had to face. It is hard to imagine two people more different than Herzog and Kinski: "...stone and waves, the coldest ice and hottest flames have more in common, differ less" but they both were driven and obsessed artists. Famous for his wild and ferocious talent and temperament to match, Kinski was incredibly difficult to work with. He wrote about himself, "I am a wild animal born in captivity, in a zoo but where beast would have claws, I have talent". Kinski's talent was fully realized in five films that he made with Werner Herzog over a fifteen-year working period, starting with astounding "Aguirre, the Wrath of God" (1973), and then following with "Fitzcarraldo," "Nosferatu" (1979), inspired by Murnau's silent vampire classic; "Woyzeck" (1979), about a 19th century army private who seems mad to others because he looks and acts so differently from them, and "Cobra Verde" (1988). It is impossible to imagine any other actor starring in these films and they are without doubt the best Kinski ever made (and he made hundreds of films). Thanks to the Herzog's documentary we are able to learn what exactly went on behind the stunning images and unforgettable performances. According to Herzog, "people like Marlon Brando are just kindergarden comparing to Kinski. He is mad and unpredictable." They liked each other, they hated each other, and they respected each other at the same time making plans to murder each other. 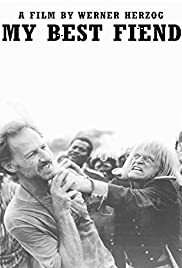 Kinski, who respected Herzog, and valued his friendship, confessed to the director that in his autobiography he would describe their relationship in not very flattering terms - otherwise, the crowd would not read it. Herzog recalls how they both would sit together at the bench after the shooting and discuss what Kinski would write in his book. I am curious if they discussed and agreed upon the following passage and if Herzog helped Kinski with some of the colorful metaphors: "I absolutely despise this murderous Herzog! Huge red ants should p**s into his lying eyes, gobble up his balls, penetrate his a**hole and eat his guts." Even after watching the fascinating documentary, it is difficult to fully understand the relationship between two giants but as Herzog admits, the only thing that counts is what we see on the screen and what we see is amazing.